Most of my 2nd to 5th grade students tend to read within the same literary genre. Fantasy is by far the most popular, from the Magic Tree House to the Deltora Quest and Percy Jackson series. To motivate my students to explore other genres as well, I’ve decided to begin Badging the Library. It’s baby steps at first, but I am hoping to expand eventually. You all have seen digital badges–maybe in the form of a community badge displayed in the sidebar of your favorite blog? Or possibly you’ve downloaded AASL’s Rising to the Challenge conference attendance badge? Then there are achievement badges, which are popular in the video game industry. I’ve created skills badges. The purpose of skills badges is to allow students to demonstrate that they have met a learning objective. A great example is Khan Academy, where badges are awarded to display mastery in seven unique skills. My genre reading badges are not at all as elaborate as Khan’s, but I do hope they are just as motivating. 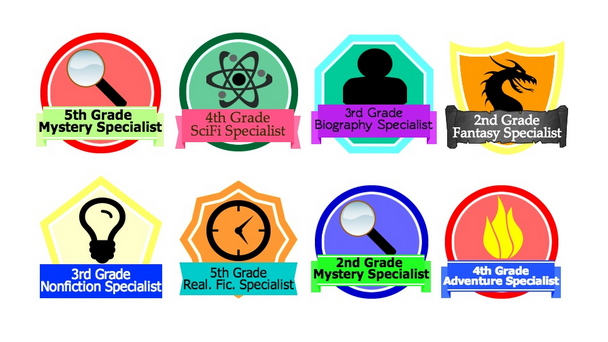 For now, I’ve created seven different genre badges for students in grades 2 through 5 (28 badges total). Creating the badges was much easier than anticipated. I looked at various badge designer options and eventually settled on openbadges.me by MyKnowledgeMap (they do have a WordPress plugin as well). To create a badge, you simply select from various choices for each the shape, inner shape, icon, banner, and text. Super easy! 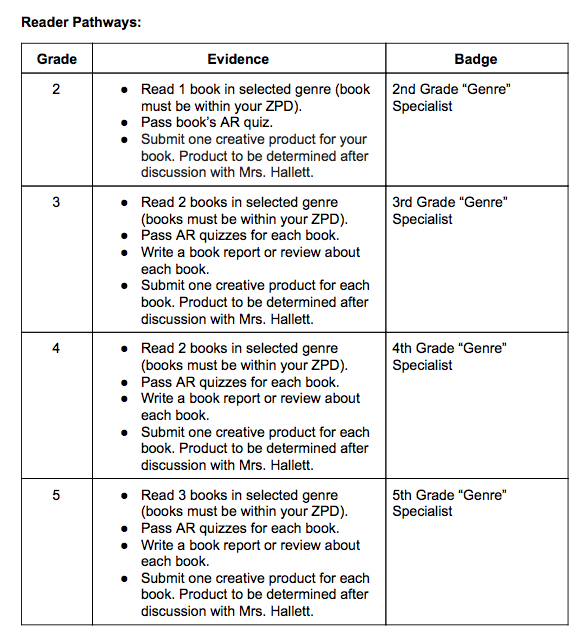 To earn a genre reading badge, students have to complete a learning path (see below). The creative product can be anything from a recorded book talk to a trailer to trading cards to a comic strip to mindmaps to animations… Badges will be collected in “My Badge Backpack”, a page on each of my student’s blogfolios. My goal for the badge implementation is to serve as a reading incentive program. Moreover, I want to entice students to explore new genres. In this sense, the learning is entirely student-driven, thereby empowering them to play a stronger role in their own learning. Students are not required to participate, although I do hope that many will. So while I am starting small, I see great potential for expansion. For example, one of my curricular areas is digital citizenship. Rather than making badge earning voluntary, it could be a form of assessment–letting students demonstrate what they know–and documenting it for instructional purposes. We teach digital citizenship through a badge learning course for all our middle schoolers and I just love this. Thank you so much!!!! Love it! Do you have different requirements for each genre? No, other than the grade-specific pathways listed in the post, I do not have any other requirements. I want the students to be motivated to participate, so I let them choose a creative product. However, they discuss it with me first. Do you have the files for the badges you made for the bulletin board or the ones you gave the students? I love you idea and would love to do the same thing. 1) Do they keep the badges on their student folder or something? 2) If they complete them all within the year, do you anything extra? So glad you like the badge idea! 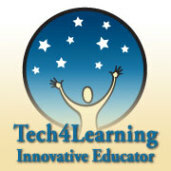 I am not a TPT seller… My students collect their badges on their school blogs. I have not had anyone complete the badges within a school year. I’ll email you! 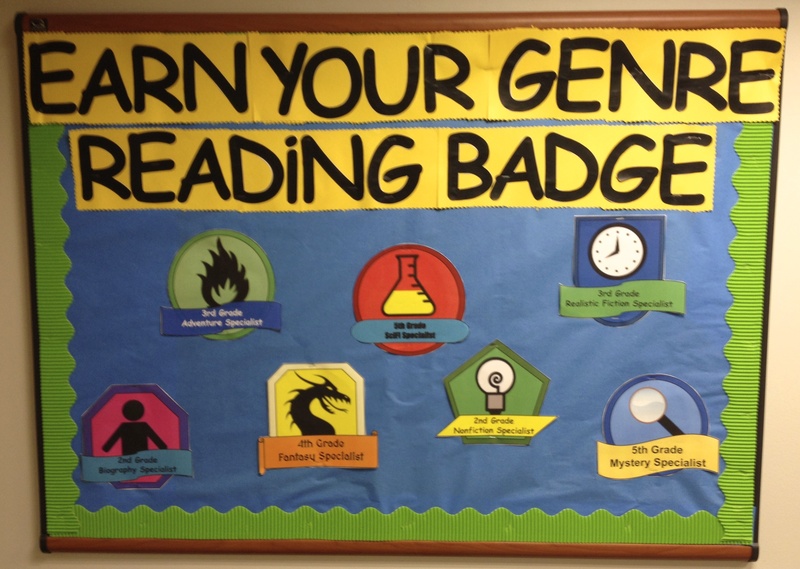 I’m interested in using digital badges in my K-5 media center and found your genre badges in my research. Would you be willing to share them? I registered for an openbadges.me account but haven’t found a way to connect to other users or share badges on that platform. Is there a way? 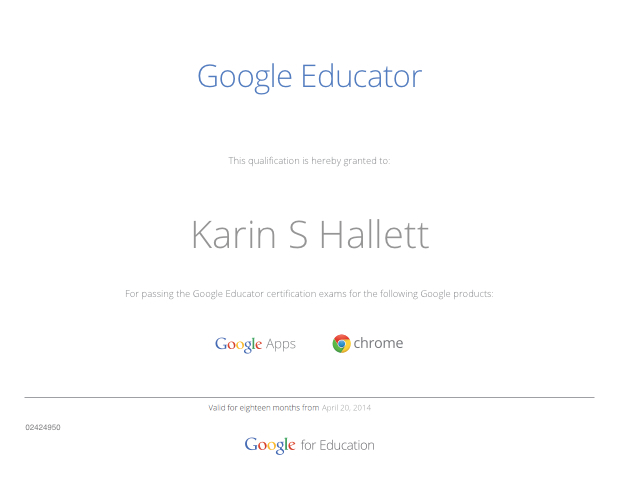 Also, I am a G-Suite educator (GAFE) and use Google Classroom with my intermediate students. I want to create digital badges to showcase their GAFE skills too. Have you ventured into that arena as well? I look forward to hearing from you. Thanks so much! I ran across Daniel Sharpe (http://www.getsharpe.us/learning/digital-badging) in my research as well. He has a *new* Google Sheets Add-On called BadgeU. You might find it interesting. Hi! I will be a brand new teacher this year. Saw this on Pinterest and love the idea. However, I was curious as to exactly what you mean when you say that students have to submit a “creative product” for the book. I’ll be in second grade, could you elaborate on that a little? Thanks so much! Hi, Aubrey! A “creative product” can be anything, including a simple book report, a book talk, a character description, a presentation. If your students have access to iPads, there are a lot of apps that allow students to be creative; for example Book Creator or Wixie. Or perhaps a student read a book about an inventor and re-creates the invention using Legos. The nice thing about badges is the ability to personalize requirements for each student recognizing ability and interest. Discuss the options with each student. Hope this helps! Thanks so much for sharing your process! I am using it as a guide as I work on building something similar in my 4th grade classroom. This was so helpful!